Spring cleaning can potentially be a very dangerous activity. A few days ago, I had a small mishap while carrying some old window blinds to the dump truck. Feeling manly and trying to carry two blinds at once, I managed to pull a mysterious muscle in my chest, which resulted in the worst stabbing pain imaginable. I tried to think of ways to soothe the pain, and the first thing I thought of was sushi. Since it was a gorgeous sunny day, I took the Seabus over to North Vancouver and walked stiffly like a penguin into Hachi Hana. 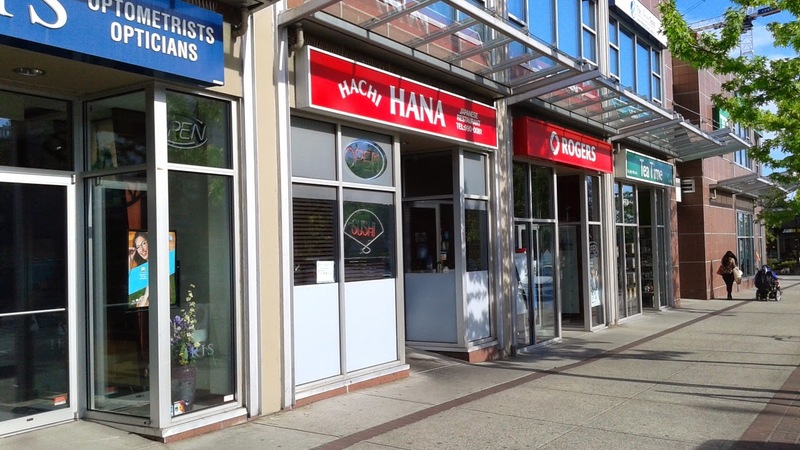 Hachi Hana is Korean-operated and is one of the most popular sushi restaurants on Lonsdale Ave. 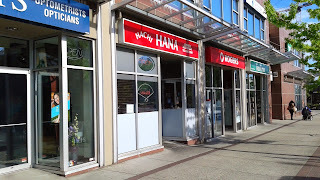 I first visited Hachi Hana a few years ago and found their prices to be some of the lowest in the area. Since then, the prices have increased considerably, but so have the portion sizes. Well, the price increases sure worked because the restaurant was full of diners during prime dinner time on a Tuesday evening. I started my dinner with the Dinner Box B ($21.95), which came with Goma-ae, Tuna and Salmon Sashimi (a spicy tuna option is available), Nigiri Sushi (tuna, salmon, ebi, tai), the Big Dynamite Roll, a Chicken Teriyaki (a beef option is available) with Rice, a Miso Soup, a House Appetizer, and a Green Salad. The Green Salad came as a small bowl of mixed greens. The vinaigrette was tangy and citrusy in flavour. 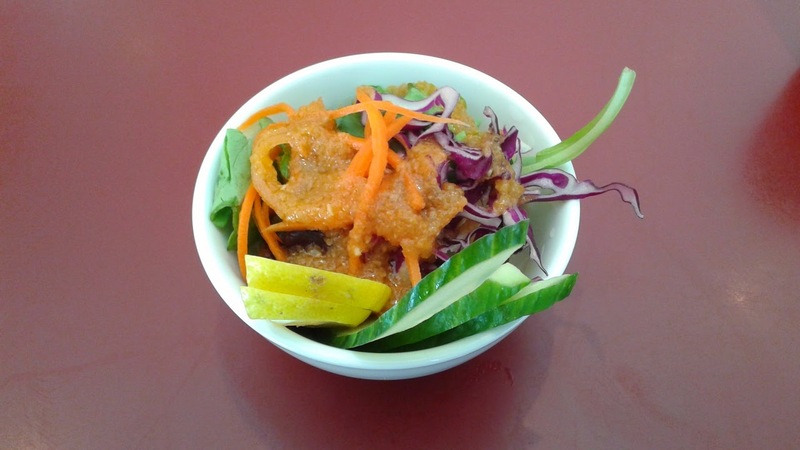 There was certainly enough flavour with this salad; by the time I got to the bottom, there was a small 1-centimeter-deep pool of vinaigrette left over. I always prefer this rather than a shortage of dressing. 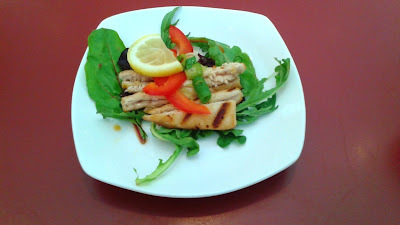 The Grilled Tuna was on the house! From what I saw, every table received a complementary dish, which I thought was a very nice gesture. The tuna was graced with a few drops of lemon juice. It was a bit dry, but I also found it interesting how it was crispy like a grilled sandwich. Before the remainder of my dinner box arrived, I received the Seared Toro Nigiri and the Unagi Nigiri (which I had ordered separately). Both pieces of nigiri were remarkably large. The Seared Toro Nigiri was just a touch overseared, while the Unagi Nigiri had a soft texture and a delicious, sweet taste, at least on the top. 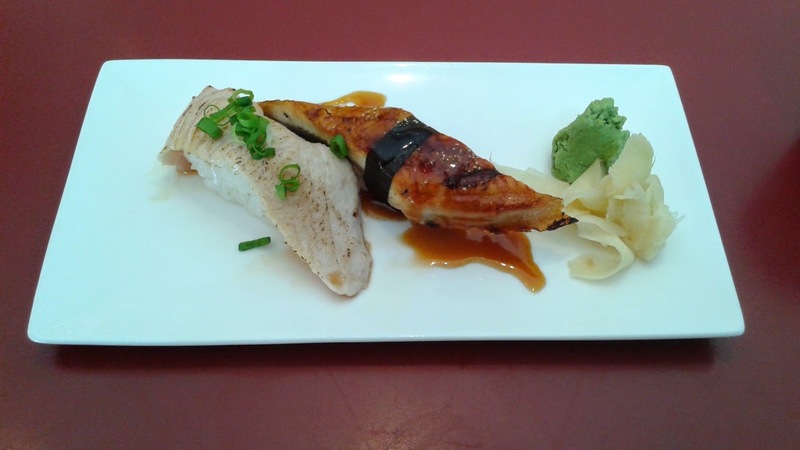 The skin of the unagi was somehow crispy and burnt, which made for a very strange combination of textures and tastes when the nigiri was eaten as a whole. As for the rest of the dinner box, everything was immaculately placed (except for one speck of rice) and I liked how one of the slots was in the shape of a boat. In addition, the portion sizes were huge! Unless you are the proud owner of a pen from Anton's Pasta, you would most likely have trouble finishing the whole dinner box. 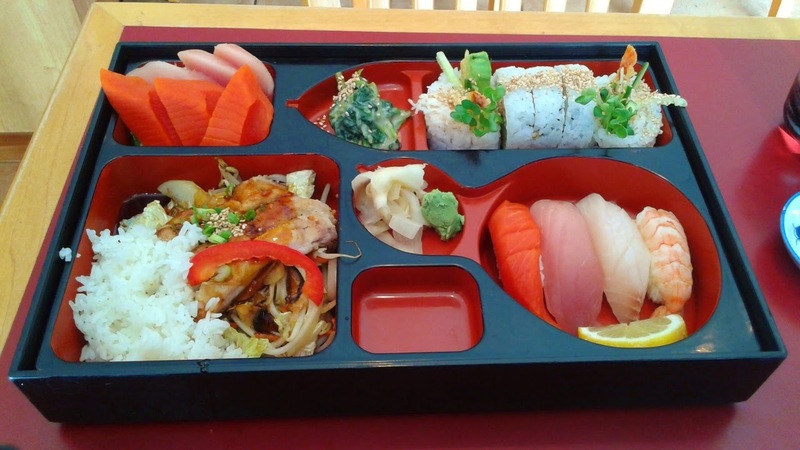 This was, without a doubt, the largest dinner box for one person I had ever seen. 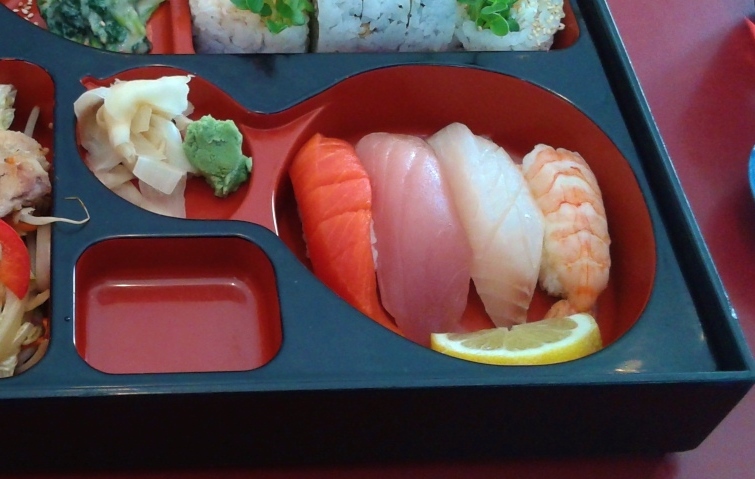 The sashimi came with 3 large pieces each of tuna and sockeye salmon. The Tuna Sashimi had very little flavour, although it had a soft texture despite being cut into thick pieces. The Sockeye Salmon Sashimi was almost completely bland and lacked a smooth texture. Dunking it in as much soy sauce as possible made it a bit more edible. The Goma-ae was easy to digest and was the only item of the box to come in a small portion. 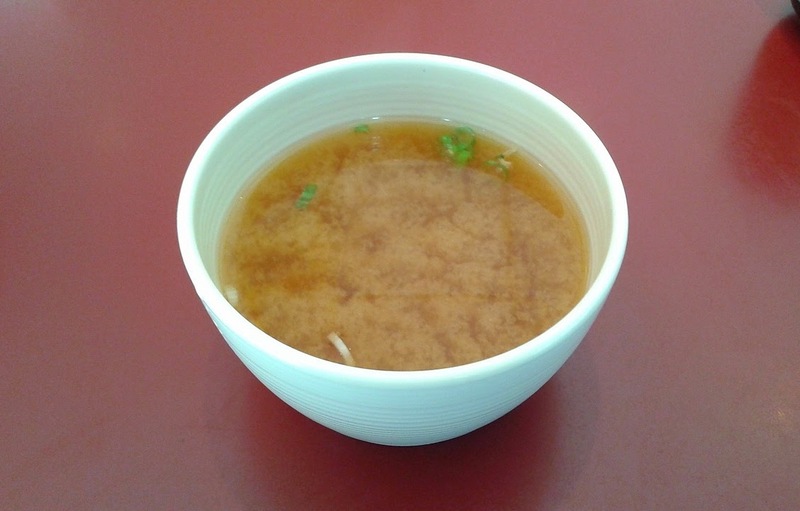 As much as I like Goma-ae, this one was rather disappointing. I couldn't tell if they used peanut sauce or sesame sauce because the sauce was very watery and tasted like peanut shells more than anything. Maybe it was a peanut shell sauce? The Big Dynamite Roll came with 5 enormous pieces consisting of prawn tempura, cucumber, avocado, and daikon. It certainly lived up to its name. 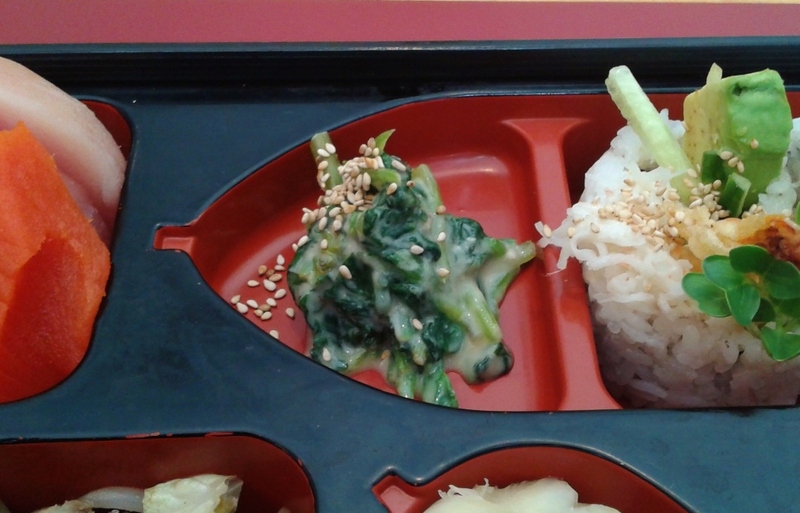 The rice was tightly packed but some of the pieces still fell apart. The small bit of mayonnaise helped livened up flavours, while the tempura was crispy with some occasional hard parts. The Chicken Teriyaki was well-executed. 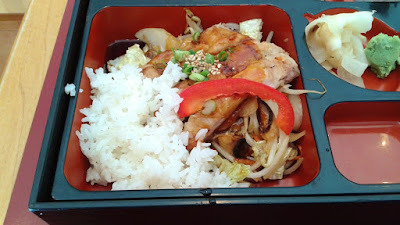 The chicken had a smoky BBQ taste and the bean sprouts and other vegetables underneath were well-dressed with teriyaki sauce. Since I don't believe in wasting food, I ate the Sockeye Salmon Nigiri and the Tuna Nigiri despite the blandness issues. 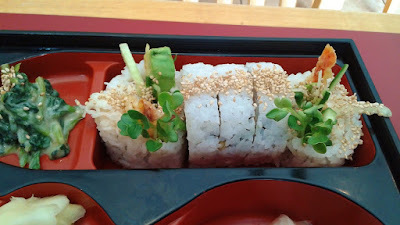 The Tai Nigiri was weak in flavour and chewy, while the Ebi Nigiri had a nice sweetness and a nice snap. I found the sushi rice slightly gummy and chewier than normal. I'm not completely sure if this was intended to be the House Appetizer, but it was the only thing I received that could count as one. This was a fresh and refreshing appetizer (or should I say dessert?) 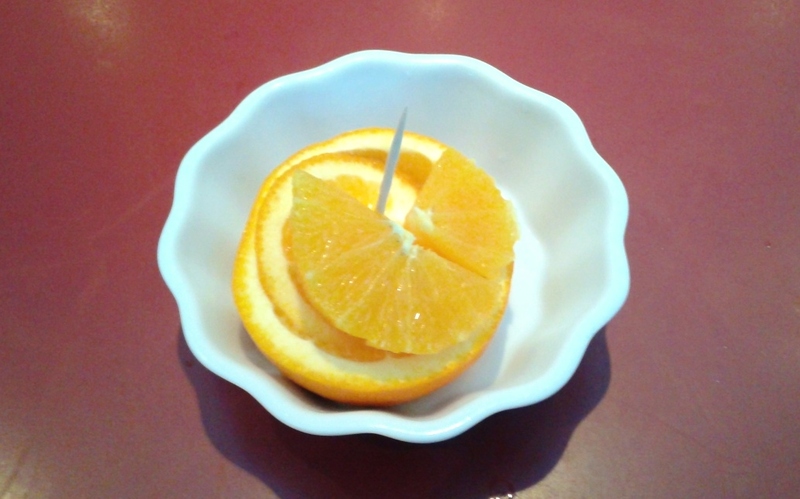 and the sliced orange had an excellent, sweet taste. I found the service quite friendly and my server even came around several times to make sure that everything was okay. Besides being stuffed so full it was hard to breathe, things were okay for the most part. 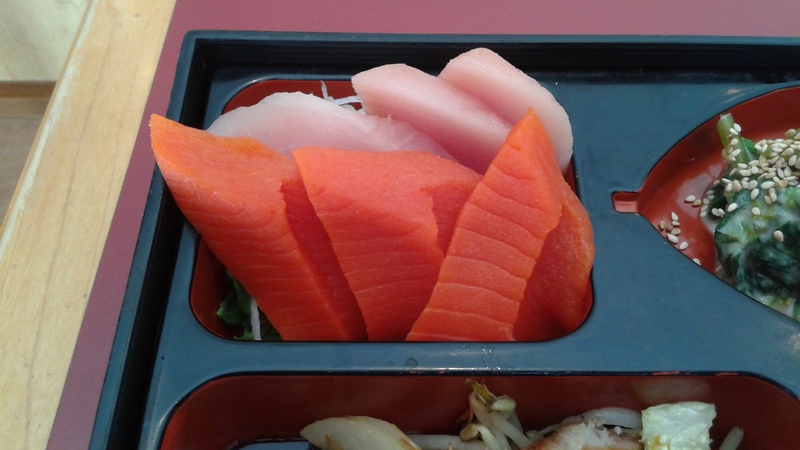 I would have preferred smaller pieces of sashimi that actually had flavour rather than large, bland pieces of sashimi. For me, larger portions can make up for higher prices, but not for both higher prices and lower quality. However, the steady stream of customers seems to indicate otherwise.